Enviro-Gods: Hesperana - Website of shawnsheehy! focal point for mercy pleas, Hesperana is a contemporary invention contrived to address contemporary concerns. Neil Gaiman’s novel American Gods provided inspiration for this notion. Hesperana is the world’s first global and pan-cultural deity. 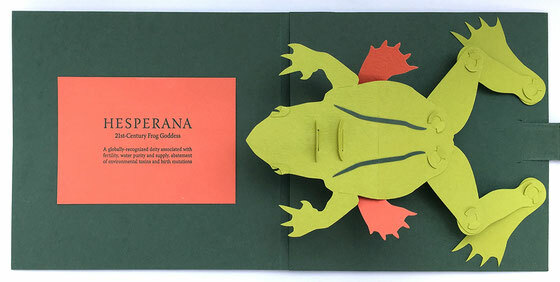 Her name is a blend of the word esperanza, Spanish for ‘hope,’ and rana, Latin for ‘frog’. This single folio pop-up was developed for inclusion in Hand Papermaking Inc.'s 2010 portfolio titled "Paper in Motion." There are no single-folio copies available for sale; contact Hand Papermaking Inc. if you would be interested in purchasing a complete portfolio.